What's common between the LG LS970 "Eclipse" for Sprint, the LG E970 for AT&T, the seemingly Korean version of those SKY IM-A850, and the HTC 6435 for Verizon? 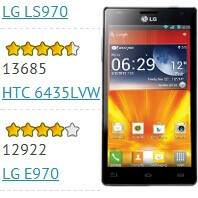 Well, they are all running the upcoming quad-core Snapdragon S4 Pro with MSM8960 chipset and Adreno 320 graphics processor. Anything else? Well now, those occupy four of the top 5 slots at the GLBenchmark website in the offscreen test that's independent of the screen resolutions. They are topped only by the new iPad with its mighty PowerVR GPU, yet, considering how close the numbers are, the final versions of those phones might very well be with the most powerful mobile graphics on the market. Moreover, the new iPad has much more pixels to take care of, but those devices have to power some pretty high resolutions, too - 1280x768 in the case of LG's upcoming flagship, and the whopping 1794x1080 in the case of HTC's monster, to which we have to add the extra pixels for Android's on-screen navigation buttons. We already saw the LG E970 for AT&T beat the new iPad in some graphics benchmarks, so once these quad-core beasts from LG and HTC hit US carriers, hopefully for the holiday shopping season, we can expect the Adreno 320 GPU and the four "Krait" cores built with the 28nm process to make them the most powerful Android handsets on the market. The LG LS970 for Sprint has a placeholder picture which very much looks like a black Optimus 4X HD, so we wouldn't read much into it now for the final design. as long as it has a quadcore battery i will be happy. however, i am sure somebody will tell us, "quadcore's run more efficiently b/c they are in harmony and take less load off the battery...blah blah blah..as compared to a duel core that is overclocked"
"quad cores run more efficiently because they draw less power to do the same task as a dual core of similar design". Good enough? :) Its about time the Crapdragon S4 got its Adreno upgrade. Once OMAP and Exynos5 come out it will still be last place.. but then it will be last place in the super car club which is still a respectable slot. But till those other SoCs come to the market it will take the FIRST spot for quite some time, won´t it? In other words: people could have said the same of the Exynos 4412 (or Exynos 4 Quad as they call it) when it took the spot as the most powerful SoC. the rumored release dates for the S4 Pro devices lines up with when we should start seeing OMAP5 devices. I think the next Nexus will be the premiere device IF there is a new Nexus. the 7 has thrown things way off. there might be a JB powered phone release in the Fall but who knows. Love how you call it crapdragon, especially when its proven to be anything but. The S3 was overrated for sure, I'll give you that, but otherwise they have proven to be pretty solid processors. The S4, in a dual core config, is similar perforamnce to the Tegra 3, a quad core. The Pro looks like it completely smashes the Tegra 3. TI and Samsung haven't came up with a processor of that grade yet, so don't be so quick to judge. I know many people on here don't see your facade but you are just as much of a fanboy as people like Gallitoking and Taco50. Except its a weird pro samsung anti apple anti htc anti qualcomm fanboy. Only some morons on this blog will tell you how energy efficient multicores are. The reality is totally other way around. Multicores were made to do more work (by draining the battery faster) - not to save battery. If you're not really using all cores, idle cores will still draw current. So either way - heavy multitasking or idle standby - a higher core config. will always give you lower batter life. With everything aside, this S4 pro looks like a real beast - can't wait to see a phone with this baby. I really wish battery advancements were as fast as CPU/GPU advancements! The poor battery is left far behind with little consideration. Yet every smartphone user would love to have more battery life. The S4 made some nice improvements in the power consumption department, so the progress being made in the CPU/GPU area are quite welcome while we wait for battery tech to catch up (new advancements don't always play nicely in the real world). Yep, the S4 in my Inc 4G is doing pretty well so far...yesterday, on my first full battery cycle, I got 14 hours, 4 hours of screen time as well as 4 hours of Hotspot tethered to my tablet...all on 4G! Yeah, I wanted one pretty badly (until Verizon decided Worry Free doesn't mean keep your Unlimited) after seeing the reviews stating 20 - 50 hour battery life of moderate usage with only two reviews stating less than 20. The extended battery didn't make it too bulky either, but me getting the phone was not meant to be. Luckily my Rezound is pretty good with battery life on moderate usage despite being based on a Snapdragon S3. It barely loses charge in Standby. who didnt see that coming? ofcourse we knew s3 wouldnt last for long htc and snapdragons blend very well. i will definitely sell my international one x for this quad core krait. I hope you are not waiting for the HTC one, because it´s a TABLET ;-) It has a resolution of Full HD, 1080p = 1920x1080 (-buttons). That only makes sense for a tablet for two reasons: 1) You are not able to see such pixel density in a phone, so it´s useless 2) I´m not sure the technology already exists that is able to have that many pixels in any screen under 7 inches. It will probaly use the APQ8064 (quad-core) and not the MSM8960 (dual) that the article mentions. They have, but a display that size with such a high resolution is VERY unnecessary. Now those are true beasts! phone tech moves like a brand new corvette batter tech moves like a new smart car basicly we need to invest in battery tech before we can make quad core hyperphones in my opinion, i had 2 single core phones that barley got 15 hours under light use i now have a dual core phone that gets well into the 18 hours of use with moderate to heavy use. but im looking forward to seeing how the quad core is going to pan out. You wont notice the extra cores in day to day use, also my opinion. This phones will be the respectives Nexus from LG & HTC that will debut in a Google event this November for the unveiling of 5 Nexus from 5 makers for the celeb of 5 years of Android...the other three come from Motorola, Samsung & Sony. It all fits together now! Now that would be cool! Can't wait to see how that plays out. Will they be virtually identical in hardware or will Google spread it's 5 pronged attack with different SoCs, form factors and maybe even market position (high-end, mid-range)? If they are all going to be virtually identical then I think it'll be really interesting to see how the manufacturers differentiate their Nexus from the others, assuming Google would allow that. The most obvious spec would be the camera. If we're going to see different form factors then maybe the one from Motorola will be the one with the QWERTY keyboard, tipping the hat to the original DROID, and Sony's would be the one with the smaller screen given nothing else comes anywhere close to the Xperia Ray when it comes to pocketability, quality and design, though I would rather see an ARC-esque Nexus from Sony (hello international Xperia GX?). http://www.qualcomm.com/sites/default/files/common /snapdragon-specs-06.07.12.pdf Judging from the chart these phone's are most likely going to be S4 pro dual-core krait, there is a chance that I could be wrong though. The GS3 is looking more & more outdated as the leaked specs of these phones come out.